This Saturday's post is all about those important women in our life; whether she's your Mama, your Grandmother, Mother-in-Law, or just a lovely lady who has made you feel like you belong to her and her family-May 14th is the day to honor her and all she does! I've been very blessed with a wonderful Mama who over the years has become one of my very best friends. I truly love hanging out with her and spending time with her-she's a gem & I'm so blessed to call her mine...so sweet Mama, this post is dedicated to you! Let's jump into my suggestions for the ladies in your life. . .
You can find these all over Etsy, but for this post I picked the one that was mid-range price (between $30-40) and looked the prettiest in the sample work. I think these are such a sweet idea to gift your Mom, it's a keepsake that she can have forever even if they no longer live in that home! Y'all, I think that Shutterfly's photo books are the best gifts ever because photos are an awesome way to share memories and they do take a little time to get just right so it requires a little thought-which is sweet! Do you want to really know what Mom's love? But don't just buy them a random card and sign your name. Find a card that really fits her and shares your thoughts about her and then make sure you write a sweet, thoughtful, caring message inside. You'll get good tears every single time! I love makeup and so I'm always trying to think of ways I can share that love with the people in my life. My mama is a big fan of neutrals and doesn't often treat herself, so this would be the perfect gift! The packaging is gorgeous, the shadows are soft, buttery, and pigmented, and if you've ever smelled a Tarte palette you know they smell amazing! Or you can always gift mom her first or last initial for this gorgeous necklace. I've never owned a S'well bottle (I'm a Yeti girl, myself) but the pattern on this stunning bottle drew me in. This would be great for the Mom on the go because it keeps your beverages cold or hot while not spilling when you toss it into a bag. Plus, it would look pretty on a desk or at the gym. Perhaps your Mom really likes her furniture and is always reminding you to put a coaster under your drinks? These pretty floral dish towels are a cute spring/summer addition to the kitchen, plus they're useful! There's absolutely nothing wrong with wanting to be cozy! This wrap would be perfect for wearing out when the weather gets colder and wrapping up on the couch when the AC is running full blast. Candles in general are always a good gift idea. These candles are a gorgeous addition because she can repurpose the beautiful jar as decor when she burns through it. Bath & Body Works is also running a 2 for $24 special today (with a 25% off coupon as well) so you could stock up there! I'm a coffee nut but I haven't succumbed to the Keurig hype yet, but when I saw this in one of my Mom's favorite colors I knew it was kismet-I had to include it. If you really want to spoil your Mom this Mother's Day, upgrade her regular drip pot for one of these snazzy models. In the widget below I added some additional links to products that I really think would be great for Mama's on this day! 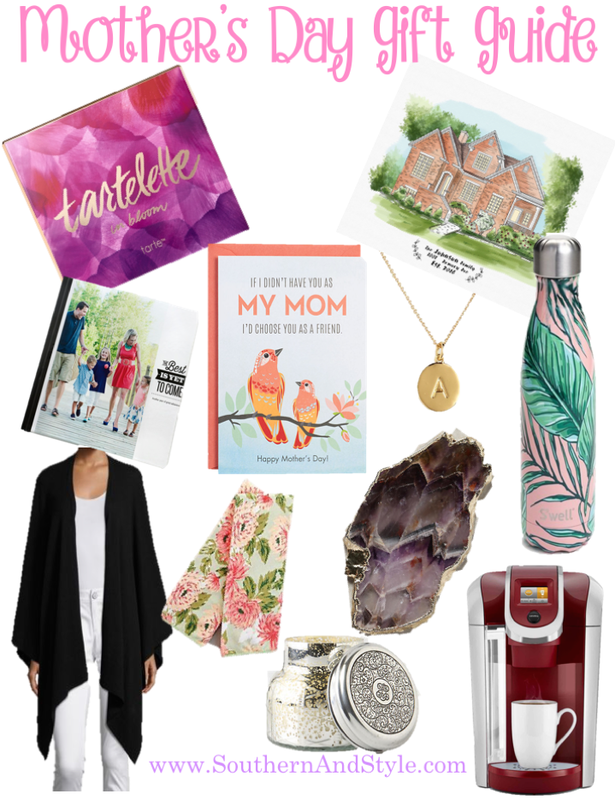 If none of these ring your bell I highly suggest something like a day trip to do something your Mom enjoys or maybe taking her to a concert, cook a meal for her, or a gift certificate for a mani/pedi or a massage/facial! I hope this helped some of y'all-let me know in the comments what you're getting your Mama for Mother's Day! These are such cute ideas! I really love the idea of the Kate Spade necklace! Cute ideas! I like the Shutterfly book idea - my mom would LOVE a photo book of my little guy! Shutterfly photo books are my FAVE. I get them for my hubby every year, so smart for mama too! That water bottle is the cutest! I love all of these options. I want a watercolor painting of our home... oh oops, sorry mom HAHA... I'll have to remember your post when I finally make the purchase!